Really, The Masters of Luxor is the first truly, lost story from Doctor Who's history. 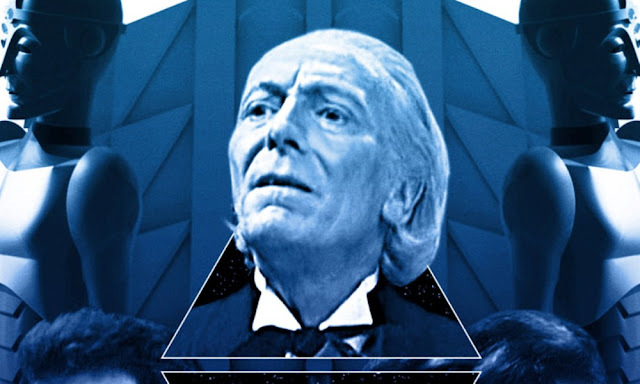 Written by Anthony Coburn, it was originally intended to be the second serial of the show, ultimately rejected by the producers in favour of The Daleks (AKA The Mutants). For the second half of The Lost Stories range, the creators moved on the Sixth Doctor to the earlier incarnations of the Doctor. Nigel Robinson adapts the proposed sixties tale, while William Russell and Carole Ann Ford return as Ian Chesterton and Susan Foreman respectively. No doubt the first thing that will strike you about The Master of Luxor is its sheer scale. A scale that one supposes would have been rendered into a few model shots had it actually been developed for television. The story opens with the TARDIS being drawn off course by a mysterious signal, bringing it to a large citadel on an unknown planet in an unknown galaxy. The TARDIS even gets to fly around the citadel, something that would have been hard to do back in the day and something we have only seen a few times since, most notably in Delta and the Bannermen and The Runaway Bride. And the first two episodes feature some beautiful descriptions of this citadel and its environs as we follow Ian and Susan's explorations. The idea that this TARDIS crew were explorers was something that was less pronounced as the series went on but is an intrinsic part of the plot in the opening episode in particular. The first two episodes see the crew on their own, pushing on into the unknown. And the cliff-hanger of the first episode ends on an almost inspiring moment, hinging so much on the danger that the crew are now in that they have no choice but to go on. And Toby Hrycek-Robinson's music is brilliant here, never has eating an apple seemed so very dangerous! The Masters of Luxor is a story which plays out in several distinct parts, from the opening eerie explorations to a robot's need to be human. We then see the boundaries of ethical experimentation, not to mention scientific ignorance. While no one could accuse The Masters of Luxor of being fast-paced, it is packed with ideas which manage to keep the story moving, so much so that it is a different story when it ends than it had been at the start. It adds brand new settings into the proceedings, not leaving the six episodes to linger in grey corridors, as can sometimes happen. We get some interesting ideas about what it means to be human that are bandied about, even if those are undercut somewhat because no one knows how to programme a robot which can be baffled by the mere act of singing. Both the narration and voice's duty's at ably handled by Russell and Ford, in much the same vein as they had done in their previous Lost Stories. Russell tends to handle the scenes between Ian and the Doctor, while Ford tackles the scenes between Susan and Barbara. They also manage to successfully change their voices so they sound like they did in the sixties while the pair both put in good turns as the First Doctor and Barbara. It is a shame though that both William Hartnell and Jacqueline Hill are no longer with us, they would be great to hear once again. It is then down to Joseph Kloska to bring life to all the other characters in the production, The Perfect One, Tabon of Luxor and all the other robots hanging about. And he too does a great job, easily differentiating his voice to give the characters their own unique sound. I particularly liked how Tabon sometimes sounded more robotic than The Perfect One. And you can't help but feel sorry for The Perfect One, even in the scenes where he is pitted against Barbara and Susan.